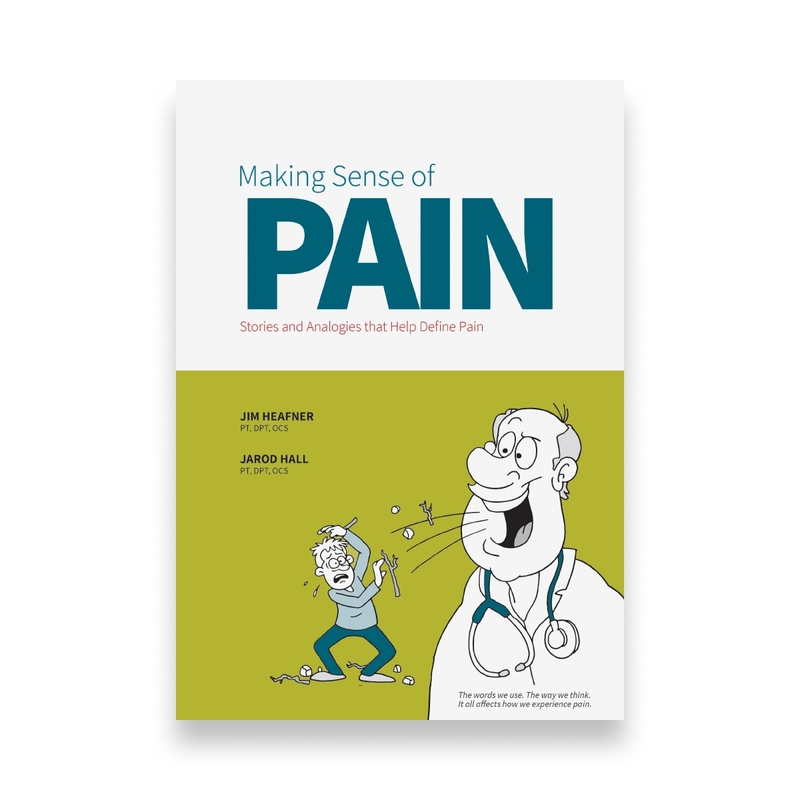 Written for clinicians and patients, this book uses analogies and stories to explain the causes of pain, the reasons people feel pain, and what motivates them to get better. This book is an excellent resource for clinicians who want to learn how to explain injuries and symptoms to their patients in simple language that makes sense. The book is also a great tool for people who are experiencing pain, to help them better understand pain, what causes it, and ways to treat it. With colorful stories and illustrations, this is an essential tool for clinicians and for any patient who is on a journey toward healing. Written by physical therapists Jim Heafner, PT, DPT, OCS and Jarod Hall, PT, DPT, OCS. As the craze of studying pain continues to make waves through the healthcare landscape - it is easy to get caught into the highly complicated nuances of pain neuro science...yet, if we know anything about treating pain, this can only add fuel to the fire when it comes to explaining these concepts to patients. What this book does an excellent job at, is offering extremely practical analogies and stories which help us better explain in a simple way, relevant concepts to those who need it the most! I can&apos;t recommend this book enough to all practicing clinicians as it will serve invaluable for giving you different options for your educational strategies and better relating to patients. “Making Sense of Pain” beautifully combines the science behind pain research with practical analogies that explain the science of pain. This book is readable and has clear examples not only for the clinician but for the struggling patient. The analogies in the book give a framework to clinicians to teach complex pain strategies in a patient friendly manor. This is an essential resource for our clinic. I will definitely share “Making Sense of Pain” with my colleagues and patients. A must have for both clinicians and patients! As a healthcare provider myself, this is one of the BEST resources out there for helping people understand pain. I frequently use the analogies in this book during my daily practice with great success. Thanks Jim and Jarod! I spend every day working with patients who suffer from pain. Pain is an ambiguous topic and everyone experiences pain in different ways and no one description or analogy applies to everyone. This book enables me to better explain pain in plain language that is easily digestible for all. I have recommended this book to fellow residents, healthcare providers, and patients. Powerful analogies to help understand and explain pain! I thoroughly enjoyed both the thought provoking introduction to pain the book lead in with as well as the analogies to explain pain. This text has helped me to better communicate with patients about pain. It would also be a suitable gift or book suggestion for friends or family that may be struggling with persistent pain or injury. Explaining pain is tricky- this book does a nice job of providing digestible analogies everyone can relate to. I&apos;m a fitness trainer who works with a lot of banged up and high-mileage clients. One of my greatest challenges is differentiating clients who will respond well to movement and fitness retraining from clients who have full-on medical conditions and need appropriate referral and intervention. I&apos;ve often felt that my job would be half as much work if I could just read my clients minds and *know* what they&apos;re feeling. This book has equipped me with the language to coax out of my clients, in significant detail, the exact flavor of their sensations so I can more easily and effectively design exercise protocols for their situations, and make necessary medical referrals up the chain when necessary. Heafner has helped me eliminate a lot of guesswork, which has made my life easier, less stressful, and more productive. Highly recommended. Must read for anyone treating people in pain. As this review&apos;s title says, this is a must read for any clinician treating people who are in pain. We know that understanding what is going on helps decrease the level of pain as well as helps build understanding/therapeutic reliance with treatment provided by the clinician. What better way than providing a story that helps the patient connect the dots in a relatable way! This book does a great job of taking common principles when it comes to pain education and presenting them into story narratives that make sense to patients which has been a very valuable clinic resource and I believe any clinic should have this as a reference! This has been an excellent resource for noceboic language. We know in the research that words matter when it comes to patient beliefs and this book does SUCH an excellent job providing countless stories/analogies/metaphors to explain the most important concepts in patient care. Not often do you find books that provide so many PRACTICAL ideas to use with patients. I HIGHLY recommend this resource; well worth it. As a health professional, this book reinforced the "power of words". Using the right words when talking with clients can empower them to make change or place fear in them which may prevent change. When used appropriately, metaphors and analogies can help our clients understand what is being communicated. This book is an easy read and increased my understanding of pain. Awesome book and must read! Have integrated these analogies into patient care already with great results. Even got one patient to cut out some unecessary pain medication. Jim does a tremendous job of his explanation of pain and how to connect it with the patients that need this education the most! This book is exactly what I needed. Simple, straightforward and practical. I have had pain for a long time and this book helped me get an understanding where my pain is coming from and what I can do to start treating it. As someone who has suffered from on-again/off-again low back problems for several years (all before the age of 30! ), this book has helped me to better understand the symptoms and pain that I regularly experience. The colorful analogies sprinkled throughout paint a clear a picture of what&apos;s going on in my body and have allowed me to approach any episode with a clearer state of mind. I am a firm believer in the efficacy of a strong mind when managing and easing pain. With this clearer understanding of my body I have been empowered to tackle the root causes of my pain and actually achieve marked improvement. As a Nurse Recruiter, I spend the majority of my day on the phone & working on the computer. This book has helped me "Connect the Diagnostic Dots" related to my symptoms and given me a greater understanding of my experiences with pain. I found the analogies to pain in Chapter 4 to be very informative and pertinent to my chronic neck and shoulder tension. Thank you for your insight! In my practice, I often am referred patients who are struggling with chronic pain diagnosis such as Neurogenic Thoracic Outlet Syndrome or Median Arcuate Ligament Syndrome. These are challenging and frustrating conditions for both the patient and physician with mixed results after surgery. In my surgical training, I have had little formal training on pain management so I sought out guidance to help me better understand what my patient&apos;s are experiencing and how I could help them. Making Sense of Pain is a well-written book that quickly and easily breaks down the pathophysiology of pain. The real-world examples provide guidance on how I can better relate to my patients and their expectations.